“In ideologies there is not Jesus…” | "...a better country"
There was a time when the Pope was considered the anti-christ. There numbers have diminished besides hard-core Chick comic fans, however, suspicion remains. Francis’s speech to the U.S. congress was scrutinized and parsed and found lacking by those on the right wing and by many conservative evangelicals, who don’t seem familiar with Catholic social teaching. Because he is a contrast to his predecessors especially with Cold War era John Paul II, his words seem to be judged primarily if they fit into the bifurcated either-or black-white thinking of the right and left wings of our own national politics. 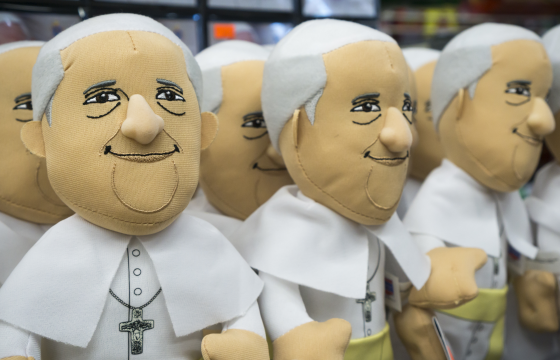 Francis is not running for office (which may explain the lack of “Jesus in my heart” sentiments some expected) and he speaks for and has responsibility for more than the small market share of big-name evangelicalism. I am not a Roman Catholic so I speak from the outside and as a non-expert, but it seems to me he hit the high points of how current culture, politics and ideology part from historical Christian teaching on the family, marriage and the value of life. He is not from Poland or Germany but Argentina – that’s why he speaks from a different perspective and maybe highlighted some spiritual rabble rousers unique to the U.S. such as Dorothy Day & Thomas Merton. That’s a whole lot more than one usually hears especially from Capitol Hill – or those with lousy comb overs trying to get there.